Hey brides looking for gifts for your bridemaids! Or perhaps you are looking for a gift for your mother or new mother-in-law! I’m talking to you!! You must check out bridesmaidgiftsboutique for the BEST personalized gifts around! Recently, Joe from Bridesmaid Gifts Boutique contacted me and asked to send me a gift. Of course I said “Yes!” and he sent me a beautiful monogrammed clutch. I cannot believe how perfect it is! I was waiting until I had the pictures taken before I started to use, and oh.em.gee. I so wish I had done this sooner! This clutch is amazing!!! This clutch has everything! It is soft. The monogram font is so pretty. And the gold pieces are adorable. The zipper handle has these cute little details in it. 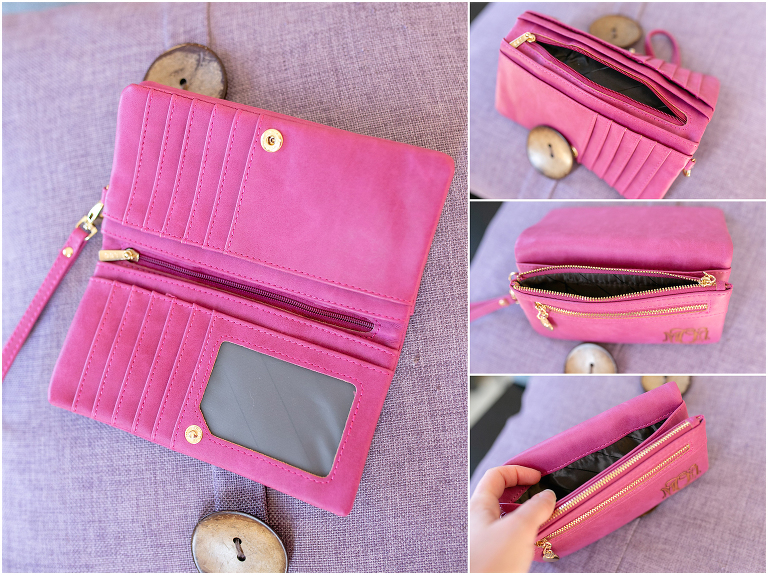 You’ll love that the wristlet part is removable if you choose to use this as a wallet. I don’t know why you would want to hide this in a bag, but it’s an option if you aren’t in the wristlet mood. Check out all these spaces for your things! You get three zipper compartments and five slide-in area for your cash, movie tickets, special momento or checks. There are ten regular card slots, one for your license and one extra long one on the side opposite your license. I blurred out my license, but what you need to know about this slot is that it is covered with a slightly transparent piece of mesh. When you’re buying that champagne to celebrate, the cashier will be able to see your license through it. If you do have to pull it out, you won’t break a nail or stretch out your wallet trying to remove it. And here! Look how everything fits perfectly!! In the wallet right here, I have $.47, my car key, four hair elastics and a bobby pin in the zippered compartments. I have a wad of cash (okay, just eight ones, but technically a wad, right?!) and two tickets in the slide-in compartments. Then, I had room for 17 cards (mostly DD and Target gift cards!) in the card holders. And look! It is not bulky at all and is so light-weight that I could hold this all night long! -AND NOW!! !- Check out their newest clutches! Click HERE to see their entire collection! To be notified the next time I feature one of my favorite products, make sure to subscribe. Like this post? Follow me on Facebook and Instagram!